MINI Cooper Forum > Vendors > MADNESS Autoworks > Get a reliable boost in performance with the MAXPower ECM by MADNESS! Get a reliable boost in performance with the MAXPower ECM by MADNESS! Our goal at MADNESS is to deliver reliable and usable bolt-on performance products. We want a product that the average person at home can install with the help of our over the phone support and/or our how-to videos. One of our products that fits that criteria very well is our MAXPower ECM. Our MAXPower ECM has received great feedback from our fellow drivers, so if you're looking for a performance upgrade that is going to give you reliable power, this is an option to consider! Not sure if this product is right for you? No worries! We offer this product with a 30 day money-back guarantee! Who else offers a 30 Day Money Back Guarantee? Give it a try and if you are not 100% impressed with the gains, take it out, give us a call and ship it back for a refund! Check out MINIMayhem.com for a large selection of MINI Parts and Accessories in stock at the lowest prices. We service, customize and modify! Give us a call (Toll Free) 888-993-7552 or 562-981-6800. The MADNESS MAXPower ECM also comes with the "Cold Start Timer" feature. When the engine is first started, the tuning module is delayed from giving increased performance until the engine has reached a safe running temperature. The MADNESS MAXPower Engine Control Module is truly the next level in Performance Tuning for the Alfa Romeo 4C. This Engine Control Module is designed to be easy to install and provides instantaneous performance gains. We currently offer these with Bluetooth Control for the R55, R56, R57, R58, R59, F54, F55, F56, and F57 models. The module is designed to safely increase the performance of your MINI Cooper JCW Roadster without sacrificing reliability of the vehicle. Unlike direct ECU flashing this module is undetectable once removed. This module also allows you, the user to easily vary the performance of your vehicle as you drive through a dedicated, easy to use phone app. We guarantee that our MAXPower ECM will outperform all other ECMs on the market in power delivery, drivability, features, and reliability or your money back! Order it, install it and use it for up to 30 days. If you are not 100% satisfied return it for a refund. It is that simple! Just call us first if you are not fully satisfied with the unit so we can assist you in the return process directions. The MAXPower Module was developed through a joint collaboration between MADNESS Autoworks and our International Performance Tuning Partners. Years of testing and development and countless hours of dyno and road testing have been invested into this product prior to its release to the public. The MADNESS MAXPower Engine Control Module is truly the next level in Performance Tuning for the MINI Cooper JCW Roadster. This Engine Control Module is designed to be easy to install and provides instantaneous performance gains. Unlike direct ECU flashing this module is undetectable once removed. 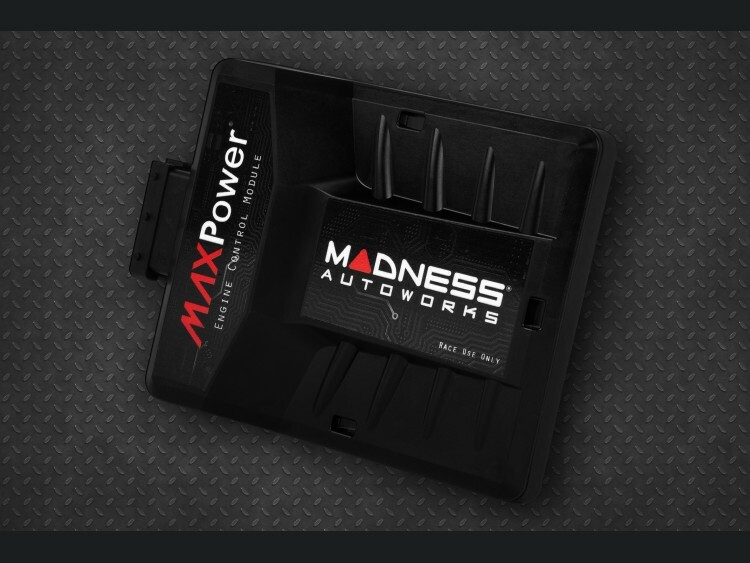 The new MAXPower ECM from MADNESS Autoworks is the newest generation of Plug and Play Performance Modules for your MINI. Designed to outperform all other modules on the market, even direct ECU Flashing! Improve the performance of your MINI by up to 20% with the MADNESS MAXPower ECM! This piggyback system ties into the factory wire harness, pulling data from various sensors, in order to increase boost and performance substantially! The best thing about the MAXPower is that it does not write any data to the ECU so it does not trigger a flash counter. which can be used to void a warranty. Because it is a piggyback it is easily removed in the event of service, sale, or lease return!